Assailant was caught on video punching and kicking an elderly man in an unprovoked attack. Over the weekend in Southern California, police arrested a suspect in the vicious assault of an 83-year-old man last week in a shopping mall parking lot. The seemingly unprovoked incident was caught on video. 29-year-old Demarrea Chante Barnes, who is described as a transient, was arrested on suspicion of attacking Tuyen Nguyen, who was hospitalized with a brain hemorrhage and broken facial bones. 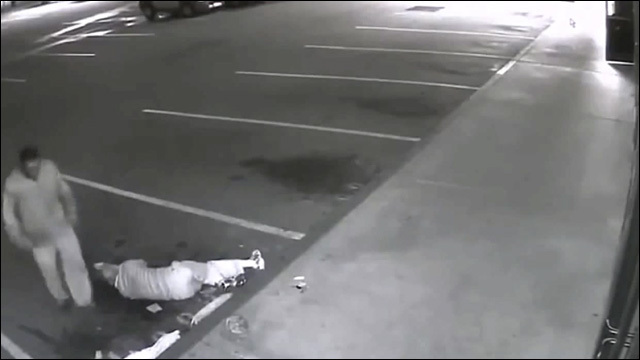 The attack was caught on surveillance video, which shows Nguyen unassumingly walking through a parking lot in Santa Ana on Friday morning, when the assailant jumps into the frame and punches him, knocking him to the ground. He then punches Nguyen at least two more times before kicking him and walking away. Barnes was apprehended by police in Anaheim, and charged with alleged assault with a deadly weapon other than a firearm, and assault with a deadly weapon with great bodily injury. Anyone with additional information about the incident is asked to contact Detective Cpl. Leo Rodriquez of the Santa Ana Police Department at 714-493-9135 or Orange County Crime Stoppers at 855-TIP-OCCS.